How Do You Hold Mentally Ill Offenders Accountable? Mental health and law enforcement officials in California are wrestling with that question as violence at the state's psychiatric hospitals continues to escalate. They are trying to determine how to hold violent mental patients accountable for their actions without punishing them for being sick. Mental health and law enforcement officials in California are trying to find ways to hold violent psychiatric patients accountable without punishing people for being sick. It's a response to escalating violence in the state's mental hospitals, where thousands of assaults occur annually. Only a tiny fraction of them, however, result in criminal charges. One case that did was the attack on Jill Francis, a psychiatric technician. She was punched by one of her patients at Atascadero State Hospital on California's Central Coast. Months after the incident, there's still a bruise under her left eye from reconstructive surgery. "I received a laceration above my eye, which took seven stitches to close," she says, cataloging her injuries. "My eye was actually pushed back and down, I had fractures in the bone below my eye, and I got a concussion, [all] from one punch." The patient who allegedly hit her is Desmond Watkins. According to law enforcement officials, Watkins has previously been in prison for assault with a deadly weapon. And when Francis met him, he was in Atascadero for the second time. Francis says Watkins "just got fixated all of a sudden that he wanted to go back to prison, and that by hitting someone that would enable him to go back." Watkins may get his wish. He's been charged with three felonies, including aggravated battery. He's one of thousands of Californians caught in the revolving door between the state's prisons and mental hospitals. Many of those people make that back-and-forth trip because of a law unique to California known as the Mentally Disordered Offender law. It says prison inmates who have committed serious crimes and have been diagnosed with a major mental illness can be forced to serve their parole in a state hospital. And each year that they're in the hospital, they get a trial to determine whether they're still mentally disordered. 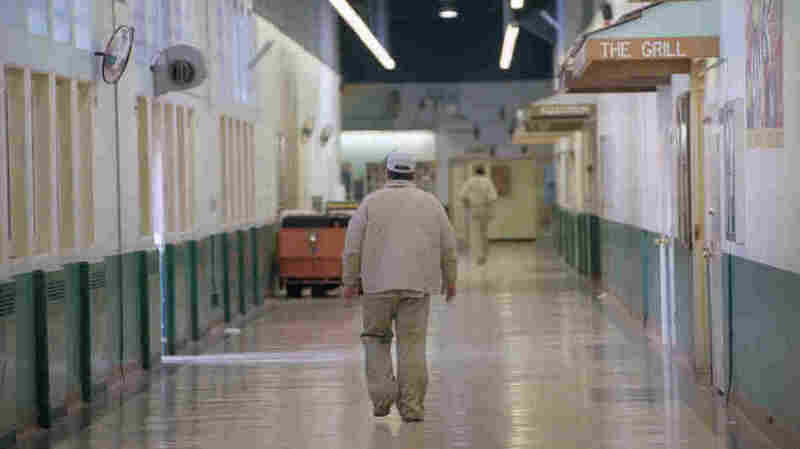 At Atascadero State Hospital, there are more than 600 mentally disordered offenders, as many as there are at all of the other state hospitals combined. In fact, they make up a majority of Atascadero's patients. "As a group, the mentally disordered offenders are the most aggressive," says Atascadero hospital director Jon De Morales. That's why the toughest ones are housed on a special unit, he says, with tiny private bedrooms and windows that allow staffers to see inside. "Kind of stark," says De Morales, peering into a room with a bed bolted to the floor and no other furniture or decoration. There are criminals who happen to exhibit symptoms of a mental disorder, [and] there are mentally ill people who happen to have committed crimes. They all end up in the same place. De Morales, who has worked at Atascadero for decades, has developed a theory about his patients. First, he says, "there are criminals who happen to exhibit symptoms of a mental disorder." Then, "there are mentally ill people who happen to have committed crimes. They all end up in the same place." And they all get treated the same. But they shouldn't, says San Luis Obispo County District Attorney Gerald Shea. He thinks mentally disordered offenders should be subject to the same laws in the hospital that they were subject to in prison, where any violent act against a staff member, no matter how slight, is treated as a felony and results in a longer sentence. Shea says extending this law to cover parolees in the hospitals is only fair. "We just feel that the employees at Atascadero State Hospital shouldn't be subjected to lesser protection than their counterparts at the state prisons," he says. So Shea sent a memo with his legal arguments for the change to his state senator, Sam Blakeslee. Blakeslee now plans to introduce a bill that would turn Shea's idea into law. But the senator says the increased penalties would not apply to every patient. "You've got people who have been determined to be so mentally compromised that they're not guilty by reason of insanity or incompetent to stand trial. This legislation would not apply to those individuals," he says. But some of those individuals are chronically aggressive. So even if Blakeslee's bill passed — and similar legislation has failed in the past — it would not solve the violence problem. That's why the Department of Mental Health is now experimenting with what it calls an "enhanced treatment unit." The first one, a pilot project, just opened at Atascadero. "Some of our own staff and the public ... think of the enhanced treatment unit as a 'bad boy' unit or a secure unit," says De Morales. "It is not." The unit will have more intensive treatment, says De Morales, and more staff, all of whom have volunteered for the job. "If it's successful," says De Morales, "we may export the program to other hospitals or take referrals from other hospitals to treat here." But at full strength, the enhanced treatment unit can only take 27 patients. That means California's psychiatric hospitals will still be searching for ways to keep staff and patients safe.